Fire Ritual at our Aphrodite Goddess Yoga Arts Gathering in Mexico this week. Photo by Melissa Robin. This Full Moon in Scorpio takes place at 5:58pm PDT on April 29th. Welcome to the Fire Festival of Lunar Beltane (northern hemisphere)! This High Holy Day on The Wheel of The Year (half way between Equinox and Solstice) is a time of celebrating your fertile dreams, body, and soul, springing forth into new life. Just as a flower blooms, in this Flowering Moon, you are being invited to honour yourself for all the ways in which you are already expanding and unfolding. Gratitude and Self-Love Rituals to nourish the body and mind are especially powerful right now. As the Moon is in Scorpio, this is also a time where the depths of your soul and psyche may emerge from the darkness into the Light of the Full Moon for you to shed and release, to experience revelations and powerful insight and to renew. This is a time of celebrating sensual delight, as all rituals of pleasure are those offered from the Goddess. Now is a most auspicious window to consciously listen to how you wish to feel in your body and allow yourself to be guided into what pleasures you. Be sure to honour the power of passionate communion (with self or other) and give reverence for the gift of your sensuality. This is the power of Creation itself! Make Love to Life: Whether this means literally making love with intentional celebration of your creative forces and pleasure, or metaphorically, this is time to put your hearts desires into motion. Dance. Paint. Sing. Play music. Weave. Craft. Vision Board: Take action to bring all your sacred visions to form with a vision board and place it under the moon light for blessed activation. Fire Moon Ritual: Get into Nature. Take off your shoes. Breathe in the air and remember that your cycles mimic Her's. Give any of your limiting beliefs and fears to the Fire (either by building one, or with candles). With movement and voice, write them down and burn them. This is an act of purification and activation and a releasing of any heavy weight or burdens you may be carrying. Then welcome in and all the feelings inside of you that make you feel WONDERFUL and move in that direction. Literally. Moon Elixir: Combine mint/rose/tulsi/hibiscus/cinnamon tea with honey and you've got a simple and delicious fiery elixir. Place it in Full Moon light (you can even add a quartz crystal into your cup for added magic), drink in all that you are great-full for and sip in celebration of your feminine lunar essence. Magick is afoot! Full Moon rituals can be done the day before, of and after the actual full moon. This is the 3 day potency period. Attributes adopted by DJ Conway. We are thrilled to share that we have Yoni Crystals in our Moon Shop available to you during this sacred Beltane portal to honour and celebrate fertility, love and joyful womb creations! 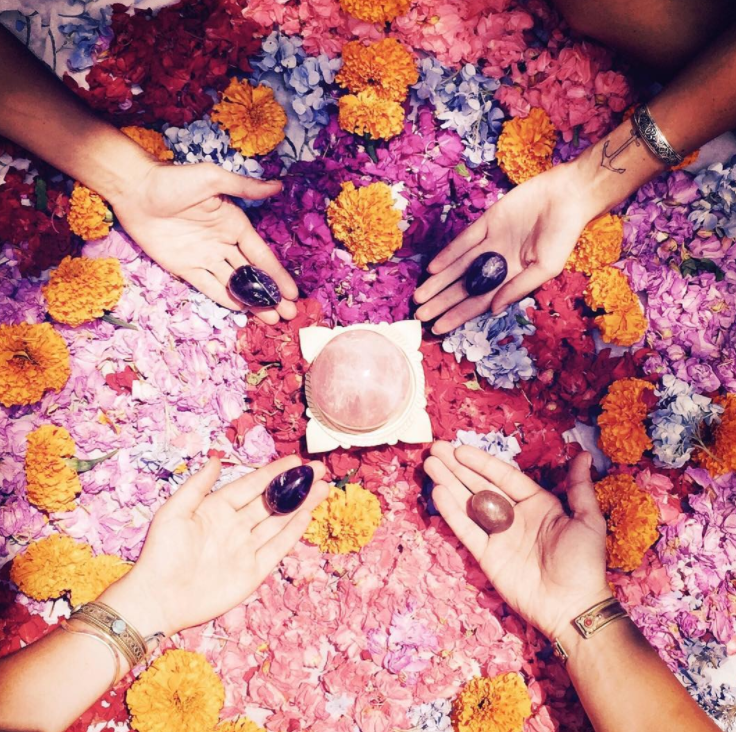 Every Yoni Egg Crystal comes with an organic pouch, our exclusive 33 Page Guide Book and Initiation Meditation. Sign up here to receive lunar rituals right to your inbox. Lunar Blessings! Posted on April 28, 2018 by Goddess Rising.